Passion focused on a singular goal is often the driver of new ideas and technology. Today the focus for many is on saving our planet from the effects of global warming a goal magnified by a global, bipartisan desire to reduce our dependence on oil. For maritime interests the opportunity to participate in a solution is significant. A recent study by the American Geophysical Union confirms long held beliefs that marine transportation is among the most fuel-efficient methods for moving global resources but simultaneously acknowledges shipping as a significant factor contributing to global climate change. By improving on the efficiencies inherent in ocean transport great opportunity exists for this industry to make a significant and lasting impact on the environment. Leading the way in reducing emissions and fuel consumption is Hamburg based Skysails GmbH. The innovative idea, in terms of both imaginative thought and probability of home run success, of using kites to tow large commercial ships was conceived by inventor Stephan Wrage. This exciting product finds its origins in the kite surfing community but, unlike its cousin, was not developed in the backyards and garages of enthusiasts for personal enjoyment. Rather the company and its distinguished partners, which include Beluga Shipping and the historic Zeppelin Power Systems, have financial goals and high level government support fueling their goal of incubating the second age of sail. 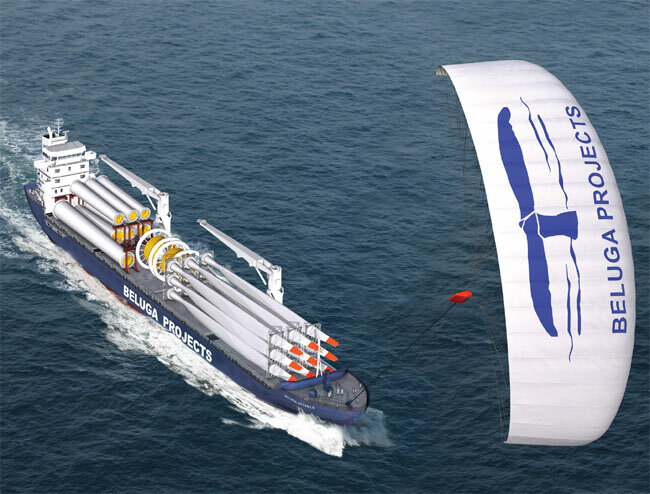 To meet this goal the partnership launched the M/V Beluga Skysails, the first new cargo ship harnessing wind power to be built in over a century, and set sail across the Atlantic early last year. The results were impressive. Launched and operated remotely from an advanced electronic control panel on the vessel’s bridge, the 1,722 square foot kite, flying between 300 and 600 feet above the ship, produced an average fuel savings of 10-15%. While pleased with the result the company hopes to double the total savings as new partnerships are formed and improvements to the system are made. To this end the US Navy’s Military Sealift Command chartered the M/V Beluga Skysails in October and is looking at ways to contribute to the project. One area with great potential for improving efficiencies is weather forecasting and routing. The company tells us that as an auxiliary wind propulsion system, the performance, and thus generated fuel & emission savings, of the SkySails system highly depends on the wind conditions prevailing along the routes traveled. In this regard, weather routing is a very important and useful tool as it allows shipping companies to guide their ships to their destinations on the most cost-effective routes while always adhering to schedule. 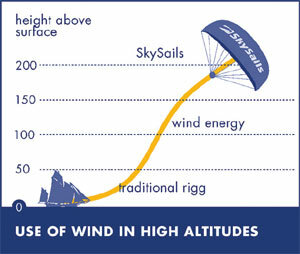 SkySails towing kites operate at altitudes between 100 and 300 m where stronger and more stable winds prevail. As to that, new forecasting products have to be developed which take these different wind conditions/altitudes into account. In general, wind speeds on the world’s oceans and thus wind power generated by sailing propulsions depend greatly on the respective region. SkySails did a global analysis of the wind energy potential on the world’s ocean based on a comprehensive database of weather data of the past six years. The results of these computations demonstrate high wind energy potential on most of the main routes of the shipping industry, e.g. on the North Atlantic, the North Pacific or in Northern Europe. 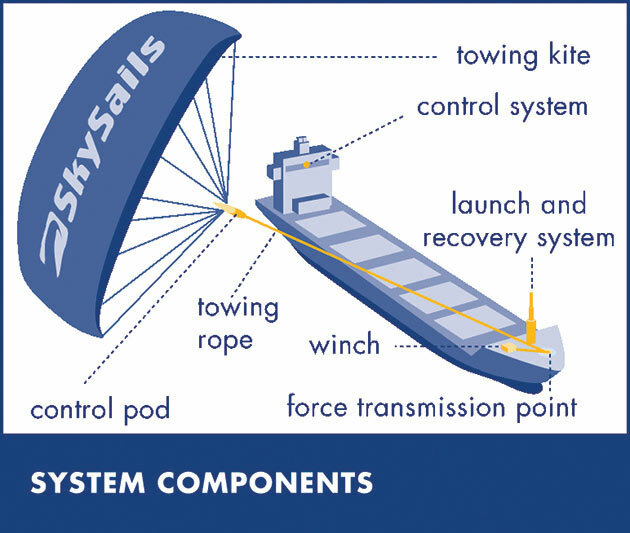 Of further importance, the SkySails-System is designed for operation in predominantly prevailing wind forces of 3 to 8 Beaufort at sea. The system can be recovered, but not launched at wind forces below 3 Beaufort. Their double-wall profile gives the SkySails towing kites aerodynamic properties similar to the wing of an aircraft. 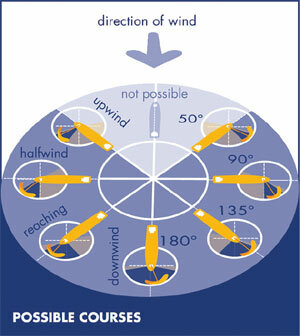 Thus, the SkySails-System can operate not just downwind, but at courses of up to 50° to the wind as well. Test results show that in practice high propulsion power can be achieved on halfwind, reaching and downwind courses from 90° to 270°. 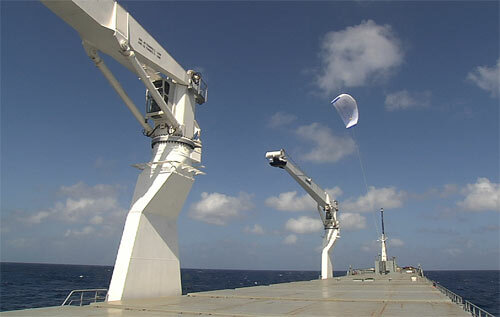 SkySails towing kites operate at altitudes between 100 and 300 m where stronger and more stable winds prevail. As to that, new forecasting products have to be developed which take these different wind conditions/altitudes into account. We are currently developing such a product in cooperation with the meteorological services provider WetterWelt from Kiel, Germany. New weather routing skills are not the only challenges facing crews of ships equipped with this technology. The SkySails system is overseen by an automatic control system housed on the bridge that continuously monitors and controls the kite, altering its flight plan by steering the unit to the optimal position and augment forward thrust. Launching and recovering the kite is also automated but, like all such systems, requires the occasional help and watchful eye of a trained crew. On the job training augments knowledge but the core concepts of the system are taught during a two-day program which teaches the theoretical principles underlying how the SkySails system is employed. 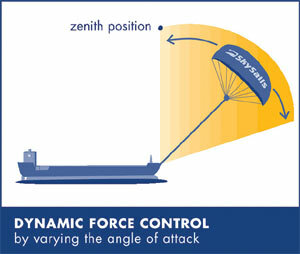 In addition to the fundamentals of SkySails technology and aerodynamics, this instruction focuses on imparting an understanding of how to utilize the system during maritime operations, including systems control, monitoring, stability, maneuver performance and deployment conditions, as well as the legal principles governing its use. One question that remains is why the Germans are alone in offering this technology. The reason is certainly not a lack of effort or imagination. In 1978 KiteShip was launched in California and became the first company looking to bring innovative kite design to the commercial shipping market. After much hard work the company seemed destined for success when, in 2002, they successfully tested the concept by propelling a tug across San Francisco Bay. Today calls to the company’s headquarters go unanswered. I last spoke with KiteShip CEO Dave Culp after the SkySails first set sail across the Atlantic and his mood matched his report of KiteShip’s recent progress; dismal. Culp claimed the strength of his competitor’s program is due to high level partnerships with government as well as shipping, engineering and marine propulsion firms. With the state of the American Merchant Marine hovering long term at the low water mark and the green movement still in its infancy commercial funding was not an option for them. To further aggravate the problem government agencies proved to be of little help to the KiteShip team and, in fact, provided much regulatory hindrance. Some close to the case have pointed to another problem hindering commercial support; the lack of economic benefit outside of fuel cost savings. To explore this point we contacted business owners via internet based social media channels like Twitter, LinkedIn and gCaptain. The most common answer among vessel operators was the industries long history of pensive debate prior to deciding on new technology which will be relied upon by mariners in the isolation of the sea. One ship owner, who did not wished to be named, said, "Fuel costs mostly get passed onto the shipper so we see little use in installing potentially expensive, untested technology to which we see no other benefit. Basically I am interested but will not be the first to try it on a large scale." This basic premise was reiterated by multiple parties but the story of the shipper is different. Importers and exporters we spoke with were all interested, albeit at differing levels of enthusiasm. At the lowest level shippers of bulk material expressed interest in cost savings. At the highest level the cost was less of a need alongside importers like Anthony Nicalo, President of Farmstead Wines. Nicalo’s concern was in the branding of his core product, environmentally sustainable wine. He writes, "Transport is the most significant customer relations problem my company will face in the future due to increased attention to the green economy. While we work hard to source wines that are truly sustainable, they still have to be shipped." Some companies in Nicalo’s industry have already turned to green shipping alternatives and, in fact, worked to make another step into a second age of sail by chartering the Tall Ship Belem to sail wine between European ports. The majority of shippers, however, have not made significant effort in reducing emissions but the idea is promising. GCaptain.com contributor "Capt.Mike" notes; "The idea needs to build momentum within the maritime community before wide scale adoption of kite technology is seen. Someone needs to be the first and the perfect candidate is a company that finds significant benefit from all angles of the equation. The perfect candidate is Toyota shipping." And Mike is right. Being both importers and exporters of great need Toyota has leverage with ship owners. This, along with cumulative fuel savings across a fleet of ships, a proven ability to pass along cost to environmentally conscience consumers and the powerful marketing message of Toyota ships flying kites, results in a golden opportunity for the auto manufacturer. In fact, the company is testing green shipping alternatives and has already installed the largest array of solar panels aboard ship to date. Combining kite assisted propulsion with solar energy generation and additional systems like Wartsilla’s marine fuel cell and ultra-effectiant bottom coatings, has potential to provide the one two punch against carbon generating marine diesel engines. Today respected Journalists like Thomas Friedman of the New York Times and countless politicians led by Al Gore have identified the need for this country to take the lead with regards to green innovation. While US based shipping companies still have the opportunity to lead the way by purchasing a large share of the 1,500 systems expected to be produced by 2015, it is already too late for this country to pioneer the most promising marine environmental idea in shipping this century. That is, unless you have an even bigger idea. Magnetic propulsion anyone? "John Konrad is a licensed Master Mariner of Unlimited Tonnage and Co-Founder of the website www.gCaptain.com, an online resource for maritime professionals. You can read more articles from John by visiting www.gCaptain.com/maritime/blog"